If you’ve been following this blog for the last month, you may have noticed that a) I’ve finally updated it and b) I really wish that I wrote more on here. So in the interest of writing more and the fact that it is the new year, I’ve decided to do another blogging challenge. This time I’m going to write one post a week for the entire year. I have to have at least one post on this blog by midnight each Thursday. Each post has to be between 300 – 600 words. Every post needs to have at least one picture. While I can – and hope to – post more than once a week, only one post counts for that week and doing more won’t count for other weeks. This will keep me from posting five times one week and then taking a month off. I can use the scheduling feature, but only a week in advance. This will keep me more present on the blog and keep me from automating the hell out of it. I need to actually revise the posts I’m making. Last time was really done off the cuff, and there were a lot of typos and errors that should have been avoided. If I do miss a week, I’ll have to post twice the next week. I owe myself 52 posts. While this post is going to count for this week. Other posts that are updates on how I’m doing or feeling about the challenge itself will not count as posts for that week. If I get a comment on a post, I should try to comment back to the person. This challenge is going to be about blogging not just writing. I’m going to be a better member of the blogging community by checking out others blogs and commenting on three posts a week. This will need to be done by each Friday. While this might sound ambitious, my last blogging challenge was for 30 days straight and that went really well. This is only going to require 52 posts which really isn’t that much more than last time and I’m going to have a whole lot more time to do it. Also, you may have noticed the rules about reaching out to other blogs. The last challenge was to really see if I could produce that much writing on a tight time-frame. This challenge is to see if I can become a much more active blogger. Part of that is sticking to a posting schedule, but another part of that is becoming part of the blogging community. Lucky for me, WordPress has a lot of great tools for finding blogs and bloggers and reaching out to them. So this is my new years resolution, and I do think I’m going to be able to stick to it. I feel pretty good about 2015 and I look forward to all of the strangeness that being a blogger is going to bring. 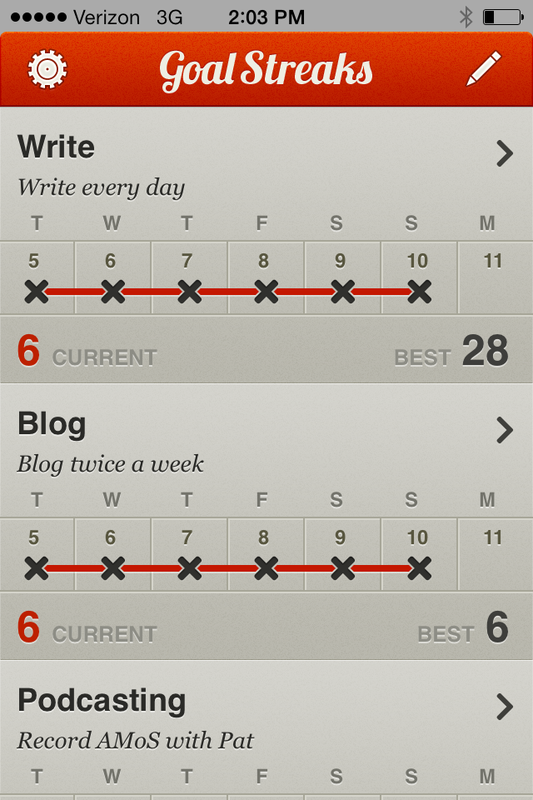 The above is an app is called Goal Streaks and I use to keep track things that I want to do regularly. Each day I write or post, I click the day and get a little X. It sounds silly but it keeps me writing. You’ll notice that with today’s post, I will have written a posted to this blog for seven consecutive days. Since this is the end of my first week of posting, I thought I would do a little write up on how I’ve been doing so far with the 30 Day Blogging Challenge. It started out pretty easy, I had about two posts in my head and I was sandbagging by writing a day ahead of when I would publish. I’ve subsequently lost that lead by getting writer’s block in the middle of a post and having wait until the next day to get over it. So right now, I’m writing this post on the day I’m going to publish it, but I have a few hours until I have to go try out a new coffee shop, so I’ll try to recapture that lead or at the very least clean up my damn desk which is covered in clutter. One thing I didn’t count on was how long the posts were going to be. My range for a post to count on this blog was between 300 – 600 words. I figured that the average was going to be in the low three hundreds because I would be struggling for something to say. In fact I average around 530 for a post. Maybe that means I take way to damn long to get to my point, but I think it means that I’m getting back into my pure love of writing. In the If-It-Was-a-Snake-It-Would-Have-Bit-Me Department: the day after a published the post with my intent to do my 30 Day Blogging Challenge, I find that there of course is an official November blogging challenge called NaBloPoMo – or National Blog Posting Month. I didn’t actually sign up for it because I had missed the dead line by one day. Such is life. It hasn’t seemed to’ve stopped me though. The weekend was kind of rough with me coming in about 20 minutes before midnight both nights. So that’s something that I have to be aware of for next week because I’m probably not going to be any more motivated next weekend than I was the last. I’m really going to have to make a concerted effort to regain my day lead time. Now that I have a little bit of a body of work on here, I’ve started experimenting with the blogging medium itself. Last night I registered the blog with the social media site StumbleUpon. I’ve gotten more traffic to this blog in one day then I have in its entire life. So if you are here from StumbleUpon, thanks for visiting and feel free to come back. If you’re a regular visitor to the site, you’ll notice that I keep changing the layout. I’m still trying to find something that I really like. I can’t currently edit the CSS of the site, but I’m going to start playing with that on my development computer and if I come up with something good, you see it soon. I think that about covers it for now. I’m going to mess with some stuff on the back end of the site and try to do some more writing on other posts. I think this challenge is going well so far, so I can honestly say this: I’ll see you tomorrow.